After tonight’s game between the Penguins and Sharks, the Stanley Cup scene shifts to San Jose for games three and four on Saturday and Monday nights. While this is the Sharks’ first appearance in the Stanley Cup Final in their 25 seasons in the NHL, this will not be the first time that Stanley Cup-calibre hockey is being played in Northern California. 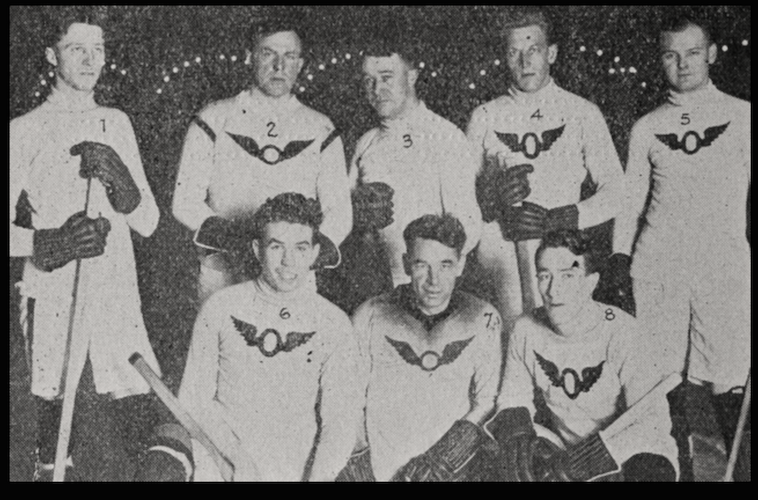 Ninety-nine years ago, in 1917, just days after the Seattle Metropolitans defeated the Montreal Canadiens to become the first American-based team to win the Stanley Cup, the two teams met again in a best-of-three “World Championship” series in San Francisco. the San Francisco Chronicle, October 7, 1916. San Francisco Chronicle stories, October 10 and 11, 1916. The San Francisco Chronicle, March 30, 1917. 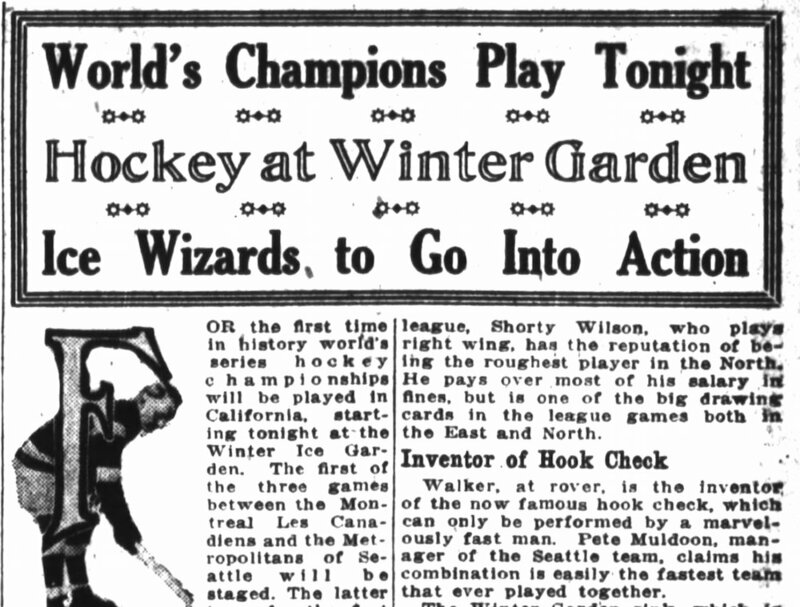 Seattle and Montreal, the San Francisco Chronicle, March 30, 1917. 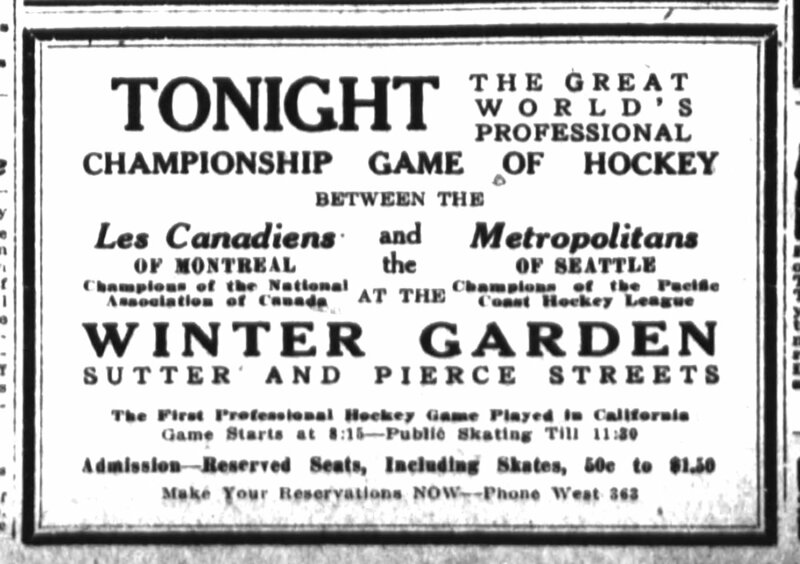 The Seattle Metropolitans and the Montreal Canadiens on the ice at the Winter Garden. 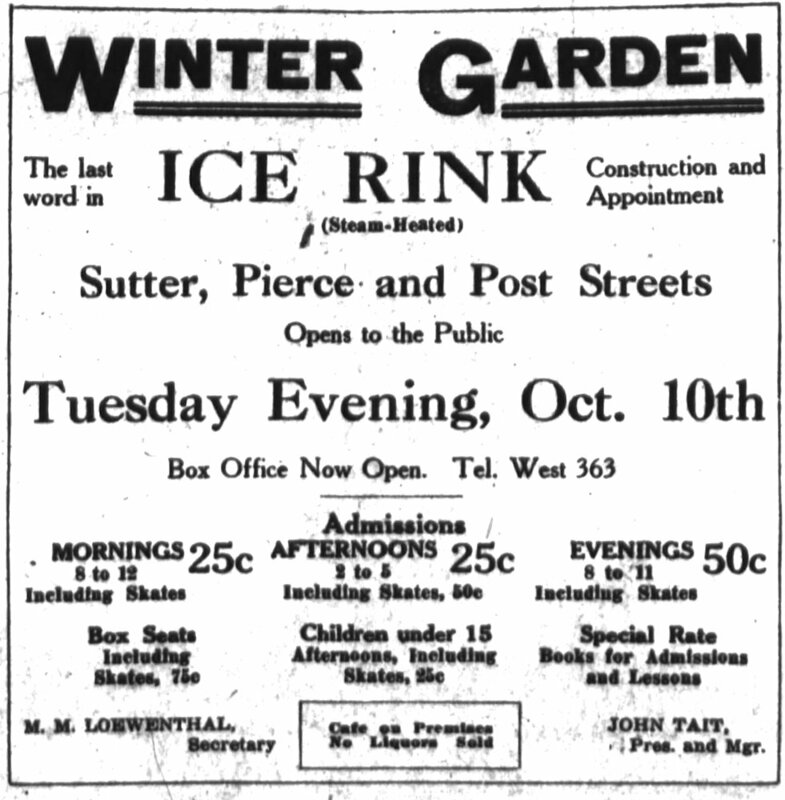 at the Winter Garden during the fall and winter of 1916-17. Note the curving lights that are also visible in the above picture. 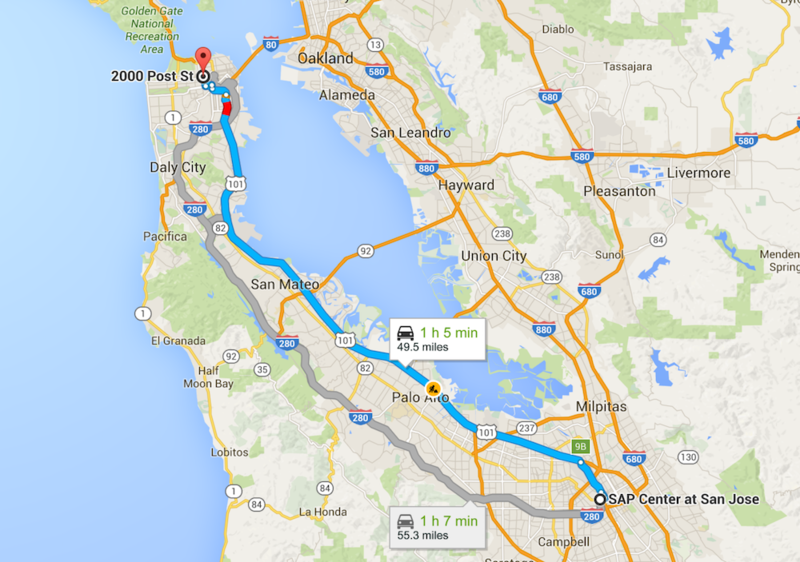 little more than an hour away from the site of the Winter Garden. 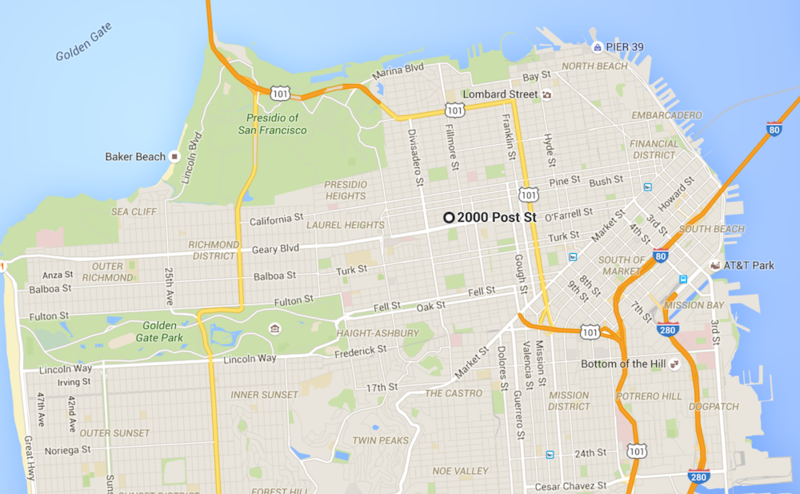 bordered by Sutter, Post, Pierce and Steiner Streets. This apartment complex (which appears to have been extensively renovated in recent years) stands today in San Francisco on the site that was once the Winter Garden and Winterland. 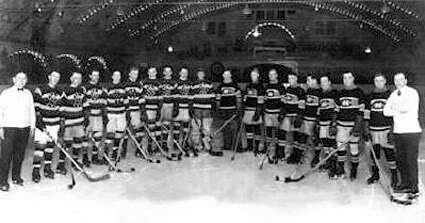 Another great insight into the history of hockey; I’m always amazed to learn of the amount of exhibition play that was organized right up to through the 1950s; it is a good reflection of how sparse the income was from playing the game professionally for many years. Thank you for sharing your knowledge and research time and time again. It is very much appreciated. Great article Eric!! Keep them coming, I really enjoy reading your weekly posts. Am I understanding this correctly? 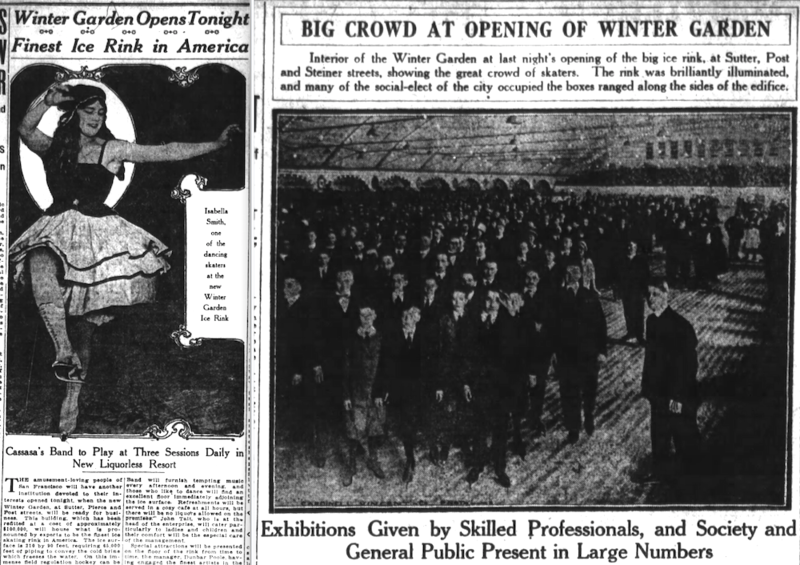 The “Finest Ice Rink in America” lasted only two years before it was converted to a dance hall? That’s sad. Can’t speak to how “fine” it truly was, but it was definitely a dance hall by the fall of 1918! Each of your stories lately has been better than the previous one!